How did you become such a terrific liar? I grew up in a family where it was always up to the listener to decide if a story was true. People were free to update, edit, and expand the stories they told. In the Lepp family truth is like water, it holds the shape of the vessel that contains it. Also, I read a lot of Mark Twain. And I love Suess’ “And to Think I saw it on Mulberry Street.” In real life I’m a horrible liar. I am always amazed when I finish a story about, say, being frozen to the side of a train by my tongue, only to have some sane, competent looking adult ask, “Is all that true?” People believe nutty stuff. How does one so skilled and celebrated in the art of fabrication write a book as truthful as The King of Little Things? 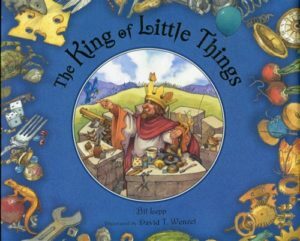 do I get to be king of?” He gave me a marble and a paper clip and said, “You can be the king of little things.’ I said, “I gotta go to my office. Play by yourself. Cat’s in the cradle.” And the story just flowed out. It seemed natural that the King of Little Things would need be a careful conscientious, kind person. And if he existed, then his opposite number must also exist. I didn’t set out to write a story with a moral – I never do- but this tale developed that way. What has surprised me it that it has become a book used for anti-bullying. I see that now, but never intended to address that subject. 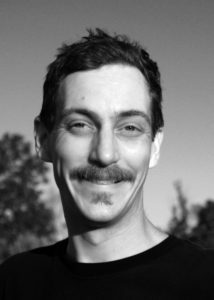 I wrote a tall-tale about a guy who talks to bugs and rust, and about a guy whose pants fall down. Don’t blame me if you find truth in it. How has growing up in West Virginia shaped you? I like to think that, by and large, we are a kind and generous people, and I try to be that way as well. Also, this state is just beautiful. Wherever you go there is miles of mountains and trees and streams. I hope that the appreciation for the natural grandeur of the state, the gentleness but self-reliance of the people, and the humor all around comes through in my stories. One thing we love about The King of Little Things is how it marries humor and truth with beautiful art and delightful word combos. Why didn’t you try to write something much, much worse? Well, I had nothing to do with the art. David, and the art director, did all that. But the way he created illustrations around the text is pretty fantastic. When I sat down to write the story, the first thing I did was write out the list of what the King is king of. That set the tone for the subtle rhymes and alliterations. I have written worse, believe me. Sometimes I try too hard in my stories to create word play and it bogs down till it is just slag and slog, you know? Most of the things I write, I write to tell, out loud, to a live audience. This story was written to tell, not to read, so I wrote it in such a way that would be fun to speak. Turns out that is fun to read. What’s next for you as an author of children’s stories? Next is finding a publisher who wants one of my stories. 🙂 I have what I believe to be the greatest expansion on Humpty Dumpty ever written. I’ve always thought Humpty Dumpty was the most ridiculous rhyme of them all, so I wrote a picture book where one guy keeps messing up the recitation, and another guy, a very frustrated fellow, is trying to get the first guy to get it right. I think it is hilarious. I’m waiting for a publisher to think the same. Excited to check out this book. Found it at the library!